A BADGER paused at the side of the road. The rush of wind from the passing objects terrified him. Out of desperation and fear he launched himself onto the strange, hard surface, running as fast as his claws could carry him. He froze as a massive thing roared towards him, a pair of huge eyes glowing white, and he whined as the great thing thundered above his shuddering body. A second later it was gone, and he started running again. He heard a siren, a screech, but he kept on running. Suddenly the objects were hurtling at him from another direction. He kept his head down and ran. As he neared the bushes another huge machine bore down on him and he pushed himself along, stumbled, pushed himself again as a shrill sound filled his ears and just feet from the grass he scrambled with all the energy he could muster and suddenly he felt soil beneath his feet…he’d made it! Breathless yet unable to stop, he tumbled down a small grassy embankment and landed on a smooth steel railing. He lay there, panting, giggling with relief, and was about to get to his feet when he was run over by a train. The grey squirrels followed the train, hurdling the concrete sleepers but keeping their tails flat to the ground. They stopped just inside the shadow created by the road above and watched as the train trundled away along Britannia Bridge’s single track towards Anglesey. Once it had gone, a squirrel leapt onto a rock while another ordered, “Fall in!” and the grey horde formed itself into neat rows. “Marines, there is a serious menace in our society today,” the squirrel on the rock told his following. “I am of course referring to the Red menace, which now plagues this land. Unless we learn about this Red curse and take action against its open threats and subversive activity, we shall lose our woodlands, our nuts, and the chance to do those daft obstacle courses on TV. From his rock vantage, the lead squirrel watched as the cohort split into two and Wachowski carried on in front along the centre of the railway tracks. They ventured silently onto the bridge, a single-file either side of the rails, road traffic thundering above them. The lead squirrel spoke into his radio. “Negative,” the squirrel on point’s voice came back. “Just a walk in the pa…” and then there was a burst of static, followed by silence. The lead squirrel waited, and then watched as Wachowski, flattened into a saucer-shape, rolled past his rock and into a bush. “Lions!” someone screamed from the bridge. The scream’s echo had barely ended when a huge lion made of stone leapt from a plinth, squashing several squirrels. It swung a giant paw through the air and sent more squirrels flying into the undergrowth. “Run for the trees!” the remaining animals shrieked, turning and scampering back down the railway tracks. But they were too late. A second stone lion jumped out from behind a concrete pillar and scooped several up in its jaws. It spat them out over the edge of the bridge and watched them tumble into the Straits. The remaining soldiers were already running. A third lion was pounding along the tracks towards them as the other two continued to kick and stamp the ground, forcing the squirrels to dart in all directions. They quickly dispersed into the undergrowth. 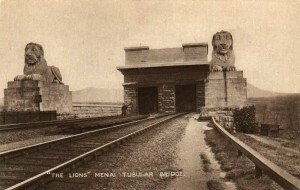 The lions did not chase them but simply roared and stamped their huge stone paws into the railway ballast. The rout was over in seconds. The lion that attacked first, Porthaethwy, turned to the other lions. There were now four of them, out of breath and restless. As Nelson clambered down from his column, Llanfair turned at the sound of scampering feet behind him and saw a red squirrel running from the island. “Another attack?” the squirrel asked. There were more red squirrels creeping along the railway tracks behind him, but they wouldn’t come very close. “Bad idea mentioning food,” Porthaethwy told Treborth. There was a long silence, eventually broken by the sound of a lorry thundering overhead. “I’m having the badger,” Treborth said finally. Llanfair muttered, “That might be preferable,” and then padded off down the railway line, his head down. “And what have you spotted recently?” Porthaethwy persisted, and plucked a small notepad from behind Faenol’s left ear. “Give me that back!” Faenol protested, but Porthaethwy skipped out of the way of his lunges, laughing. He flicked the notepad open to the latest page, where a small pencil rested amidst some scribblings. “I guess if there is one thing in this world more sad than a train-spotter, it’s a train-spotter who spots the same train.” He handed the notepad back to Faenol. “An Arriva Trains Class 142 Pacer unit went past earlier!” Faenol protested, but Porth wasn’t listening. Instead he had gone over to where Llanfair was slumped against a concrete column, one ear pricked. “Guess the vehicle?” Porth suggested, and Llanfair nodded. Treborth, who was tucking into the remains of a squirrel, decided to join them. “I’ll do the mirror,” he said. From the foot of the low wall he pulled a car wing mirror that had been crudely attached to a long pole with a twisted wire coat hanger. He leaned over the wall and held the mirror up, so he could watch the passing traffic. Then the three of them waited quietly. There was a rumble as a vehicle approached, then a series of four thuds in quick succession as the types passed over a metal drainage channel. The lions listened intently. “One-nil to Mr Llanfair,” Treborth announced. “Colour?” Porth challenged Llanfair, who frowned in thought again. They listened again. It went quiet with a lull in the traffic. Far away a solitary bird was singing. There was the hum of a small powered boat on the water. Then, much closer, they heard someone sobbing. Llanfair’s eyes snapped open and Treborth quickly withdrew the mirror. Porth looked from one to the other, eyes widening, as the sobbing became louder. Treborth dropped his mirror and nearby Faenol threw his notepad to the ground. They charged off to the middle of the bridge where they kept the net. Porth grabbed the mirror and very carefully turned it so he could look outwards and upwards to the vehicle deck of the bridge. He saw a man standing on the wall, leaning against the metal bar and looking out across the water. Treborth and Faenol returned with the net, and Llanfair stepped aside so Porth could direct. They unfurled the net and stretched it taut. Porth, watching the mirror intently, positioned Treborth and Faenol so the net covered where the man might jump. When he was happy, Porth gave a claw’s-up signal. The four lions watched as a red football shirt, marked with “Ronaldo” and a number seven, floated serenely from above to the water far below. “Crap, let him jump,” Llanfair said. “Your code,” Llanfair reminded him. Faenol and Treborth squeezed closer to the wall, ready to reach out with the net. Porth discreetly cleared his throat, looked at Llanfair once more, then nodded. He began speaking in a high-pitched voice. The sobbing faltered, giving way to several loud sniffles. “Yes, you, you poor thing!” Porth continued in his shrill voice. “Who…who are you?” the man stuttered. Faenol and Treborth reached out with the net stretched tight, just as the great bulk of the man fell and landed in it. They took the strain, then watched as Nigel bounced straight out again and fell like a stone into the Straits below. For a moment none of the lions moved, instead staring into the net where the man had very briefly been. “Some angel you are!” Llanfair said to Porth. He threw the mirror away in disgust and stomped off into the shadows. “What the hell was that?” Porth demanded. He ran to the wall and looked down. They dropped everything and ran back to their plinths, where they resumed their lifeless poses. Faenol and Treborth were able to watch as, from along the railway line, five young males stumbled towards them. Each one held a bottle of beer and they were swearing loudly at each other. “Betcha I can hit that lion from here,” a tall lad said. He pulled down his hood and took a final swig from his bottle. They stopped, and two more pulled down their hoods. “On the nose!” one said, and hurled his bottle. It smashed into Treborth’s left shoulder and the splinters flew off his back and scattered into the railway ballast. “Pussies, the lot of you.” Two more bottles rained down on Faenol and another cannoned off Treborth’s face and slapped its way through the undergrowth. They stood under the road bridge between Faenol and Treborth, idly picking up ballast and throwing it. One began kicking at a railway sleeper left by the wall. “People buy them,” the tall one said. The tall lad went to the other end, and the two of them carried the sleeper and laid it over the tracks. “Not funny.” The protester was shaking his head. Four of the five began collecting objects and piling them onto the railway tracks, while the fifth slowly wandered away with his head down. Above them, Faenol flicked a quick, worried look at Treborth. 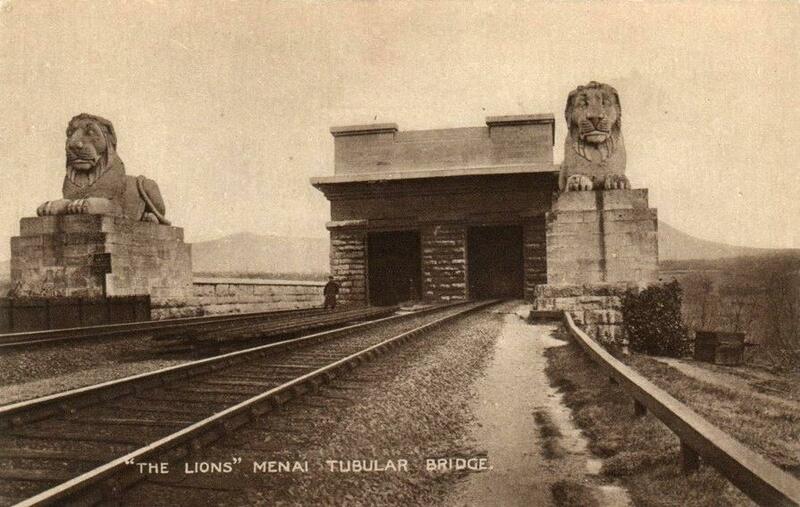 He began to move but Treborth shook his head – no, they were lions made of stone. They had to remain still. The kids spent ten minutes building a pile of rubbish that consisted of more sleepers, supermarket trolleys and a rotting sofa, all tangled up in fencing wire, before one glanced at his watch and drew in a startled breath. They ran off back down the railway line, laughing to each other. When they were out of sight and earshot, Faenol and Treborth both leapt from their plinths and eyed the mess stacked on the railway line. “There’s no time!” Treborth cried, then winced with pain as he blinked broken glass from his eyes. Treborth, his vision still a little blurred, began pulling at the pile of rubbish, but it was tangled with the wire and difficult to separate. As Faenol returned with Llanfair and Porth, they all stopped and heard the sound of the approaching train. “Virgin Pendolino Class 390, 6.14pm Euston to Holyhead service!” Faenol exclaimed. Porth stepped forward. “There will be no more tragedy tonight,” he said, and began pulling at the sofa. Llanfair joined him, and soon all four lions were heaving the sofa from the pile and throwing it to one side. Faenol glanced up as he saw the lights from the train begin to poke around the curved track, lighting the embankment. Llanfair frantically began pulling at the wire while the other three strained to drag the shopping trolley off the tracks. One of its wheels broke off, being trapped under a steel rail. The train lights became brighter and the tracks began to vibrate. Porth flicked rocks off the line while Faenol helped Llanfair with the wire. Then Llanfair tugged on Porth’s shoulder. “No more tragedy!” Porth shouted to Faenol and Treborth as he and Llanfair ran back to their plinths on the Anglesey side. In the train’s second carriage, a mother slept while her daughter gazed out of the window. She watched as the trees and undergrowth gave way to a moonlit view of the Menai Straits, a concrete pillar, and then something that made her sit bolt upright. She tugged urgently on her mother’s sleeve, waking her. “Let’s get to Ireland before we all start believing in the fairies, hmmm?” her mother suggested kindly. The girl sank back into her seat, arms folded in disgust, and she looked out of the window again as the train carried on across the bridge unhindered. In the morning a Network Rail van was parked on the track that led to the mainland end of the bridge. The van’s windows were wound down and the radio was playing loudly, tuned to the local station. Both Faenol and Treborth were able to listen to the news bulletin. “Nelson, you’re a star,” Treborth said quietly. Faenol shared a naughty look with Treborth, and it took all the resolve a stone lion can muster to stop them both from smiling.